Family rooms are one of the most versatile rooms in a home. They can be a quiet study, an entertainment room, a man cave, a sitting room, or just a place to put the kids away from the adults (which is what what our family used it for when we were growing up). The room pictured above, from this home designed by Valerie Pasquiou, is a great example of combining several of these room concepts into one. Designed as a TV room and a quiet study, the built-in bookshelves add plenty of storage for the extensive collection of books and collectibles. 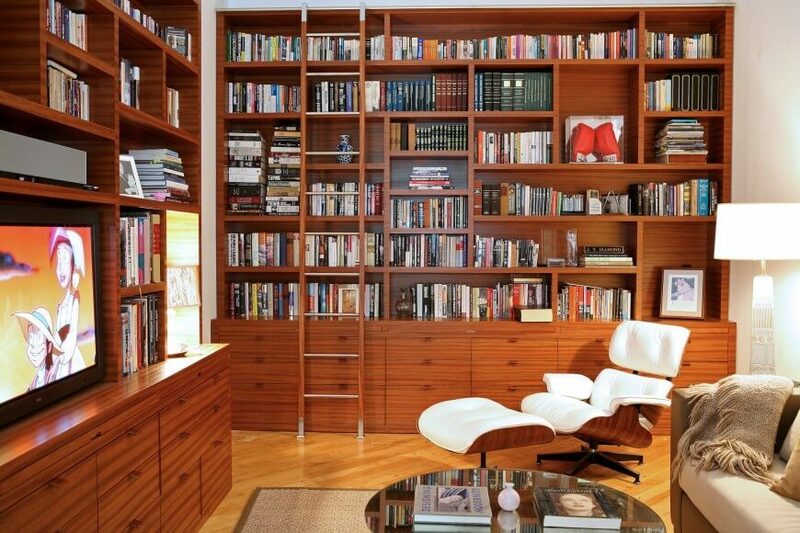 The white Eames lounge chair makes for an excellent place to sit and work or read. Oftentimes we find that the most surprising family rooms are the best ones. The unexpected is often better than the status quo. Cool tones are warmed up by the inclusion of rich brown in the furniture. Splashes of light and navy blue create interest against the monochromatic wall collage.